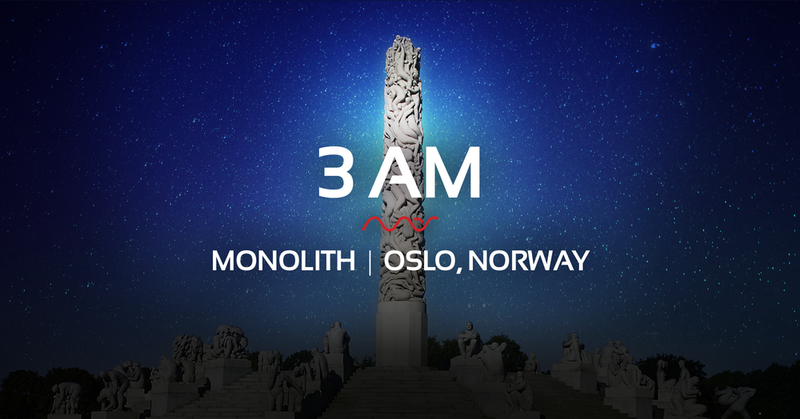 Join Mas Sajady online at the magical and sacred hour of 3AM as he meditates at the revered Monolith Sculpture in Oslo’s Vigeland Park. The Park is one of Oslo’s most fascinating sites and is the world’s largest sculpture park made by a single artist, containing more than 200 sculptures by Gustav Vigeland (1869-1943) in a range of materials (bronze, cast iron & granite). The Monolith itself is to be found at the highest point of the park, on the Monolith Plateau, and is a 46-foot high column, carved from one single granite block. It depicts 121 figures climbing to its top, seemingly on a quest for salvation. Circular stairs also rise towards the Monolith, with sculptures of figures from different life stages, from the loving couple depicted in ‘Sitting Man and Woman’ to ‘Heap of Dead Bodies’. There are a number of different interpretations of the meaning of the Monolith, including man’s yearning and longing to connect with the divine, depicted graphically here by the figures climbing their way to the top of the Stone, drawn as they are towards Heaven. Join Mas at the sacred and powerful hour of 3AM as he tunes into the energies of the Monolith and Vigeland Park, tapping into these striking sculptures and sharing his insights, whilst guiding us into deeper and deeper states of meditation and connection with Pure Source. Please note, the Event is for remote participation only. WARNING: Mas Sajady’s Exponential Intelligence transformational process is highly effective and very intense. You may find it severely challenging as old patterns shift. Working with Mas requires absolute ownership and personal accountability. If you are mentally unstable, weak, tend to blame others, and/or are unwilling/unable to take personal responsibility please do NOT proceed. After Mas’ second near death experience, he was frequently woken up at 3AM to be guided into deep meditations. Unlike a ‘normal’ meditation, Mas was instructed to meditate standing up. These 3AM meditations would last for hours while it felt like only 15 minutes to him. In these deep meditations he saw Spiritual Truths, downloaded knowledge of the Universe, transformed into different states, and experienced the joy and pain of humanity. It was during these meditations that Mas signed the divine contract for him to heal. As his abilities have grown stronger, being awoken at 3AM becomes less frequent. But Mas likes to revisit this magical hour and guide us into these deep states to help us connect to Pure Source.